After Saturday night’s UFC 166 event in Houston, it was fitting that I ended the night / early morning with a viewing of HBO’s Legendary Nights: The Tale of Gatti-Ward. It didn’t matter that it was nearly 3am when it finally ended. Even then, the adrenalin was flowing, the result of seeing everything that makes being a fight fan worth it. In boxing, the three battles between Micky Ward and the late Arturo Gatti are the gold standard for action fights in the modern era. But beyond seeing two guys throwing hands for 30 combined rounds was the heart, determination, and desire shown by both men that captivated viewers. The same could be said for last night’s bout between Gilbert Melendez and Diego Sanchez. Former training partners, Melendez and Sanchez both said before the fight that they could have charged admission for their sparring sessions, and after their 15 minute war at Toyota Center, that was apparently no exaggeration. And when it came to their three rounder, a lot of credit for what color commentator Joe Rogan called the greatest fight he’s ever seen has to go to Sanchez, who more and more reminds me of another late boxing great, his fellow Albuquerque native Johnny Tapia, thanks to his intensity on fight night. 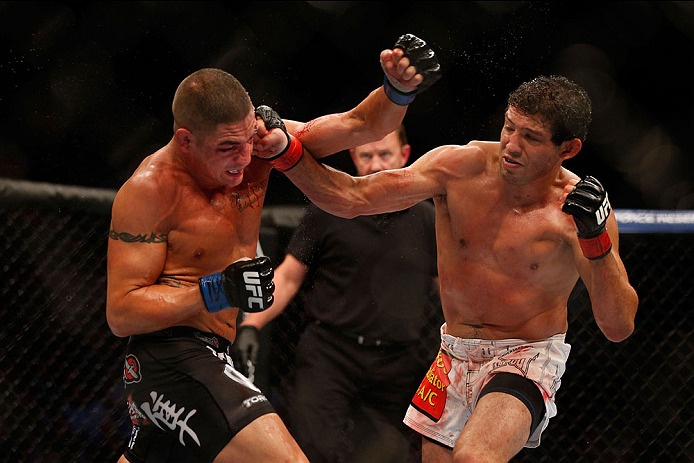 Simply put, it appeared that Melendez was on his way to a dominant win as the first round ended. “El Nino” was sharp on his feet and Sanchez was a step behind the whole way. But as the fight progressed and the blood started flowing more and more freely from a nasty cut over his left eye, Sanchez refused to go away quietly. And as trainer Greg Jackson told him he needed to knock Melendez out to win before the third round began, Sanchez didn’t just nod his head and elect to ride out the final five minutes; he tried to make that knockout happen, and he almost succeeded before Melendez cleared his head and went toe-to-toe with his foe until the final bell. It wasn’t just entertaining. It was dramatic, and it captured the difference between fighters and the rest of us. When a fighter is hurt, bloodied and bruised, the reaction isn’t the normal one – to walk away – it’s to bite down on the mouthpiece and move forward. That’s the difference. It’s why I cringe when I hear fans or “experts” say a fighter has no heart. If you’ve ever walked up those four steps into the ring or Octagon, you know what it takes to do it. If you haven’t, don’t judge. Of course, having said that, there are those that seemingly have an extra chamber in their heart. It’s why guys like Sanchez, Gatti, and Ward are celebrated, and rightfully so. If you needed any more evidence of that last night, two fights after Melendez defeated Sanchez, Junior Dos Santos lost his second straight fight to heavyweight champion Cain Velasquez. That’s the bottom line and the end result. But what many took away from that fight was Dos Santos’ unwillingness to concede defeat until he simply couldn’t fight anymore. For all intents and purposes, that fight should have been over in the third round, but Dos Santos made it into the fifth stanza, and he didn’t just survive; he kept trying to win. He didn’t reach that goal, but often, as the cliché goes, it’s not the destination, it’s the journey. And I will watch the journeys of guys like Sanchez and Dos Santos wherever they lead. SO WHAT ABOUT EL NINO? Take away his brief trip to the canvas in the third round, and Gilbert Melendez looked as sharp and impressive as I’ve seen him. His striking was on point from the opening bell, and he just looked comfortable in the Octagon. UFC President Dana White said after the bout that “El Nino” was back in the lightweight title race, and that’s good news, because the Californian is one of those longtime veterans who deserves to be at the top of the sport. He’s earned it. Despite Cain Velasquez’ pre-fight insistence that his third fight with Dos Santos would be their last, I get the feeling the two will eventually meet again, key word ‘eventually.’ In the meantime, it’s hard to see anyone on the immediate radar that can topple the champ, though a match with Fabricio Werdum in an intriguing one. A far different fighter from the one that got knocked out by JDS in 2008, the Brazilian’s victim list since then includes Bigfoot Silva, Fedor Emelianenko, Roy Nelson, and Minotauro Nogueira. He’s also survived the thunder of Nelson and Alistair Overeem and submitted the legendary Nogueira while rapidly improving his standup game. If the new version of Werdum shows up against Velasquez, it could get real interesting real fast. Velasquez’ AKA teammate Daniel Cormier was impressive in what is expected to be his heavyweight swan song, pounding out a three round unanimous decision win over Roy Nelson. Showing striking diversity to go along with his already stellar wrestling attack, “DC” will be a handful for anyone at 205 pounds, and I’m not alone in wanting to see what he can do with light heavyweight champion Jon Jones should the two eventually meet. The trio of John Dodson, Hector Lombard, and Adlan Amagov all made short work of their foes Saturday night, and did so in ways that made you already start waiting in anticipation for their next fights. In my eyes, no one at 125 pounds has the stopping power of Dodson, and if he gets you in trouble, he usually gets you out of there. He was seconds away from finishing champion Demetrious Johnson in their title fight, and when he got Darrell Montague hurt, he calmly finished him, showing that with patience added to the mix, “The Magician” is even more capable of making opponents disappear…People were skeptical that Hector Lombard would be able to successfully make the cut to 170 pounds, but not only did he make it, but his destruction of Nate Marquardt was one of his most impressive victories. With Lombard’s speed and power, he is a serious threat to anyone in the welterweight division. Speaking of dangerous welterweights, Adlan Amagov’s finish of TJ Waldburger was a scary one. Thankfully, Waldburger is fine after a precautionary post-fight trip to the hospital. As for the Chechnya native, he’s a stylistic nightmare for future opponents, and it will be interesting to see what matchmaker Joe Silva does with “Borz” in 2014. Poor Tim Boetsch and CB Dollaway. Before the epic 1-2 punch of Melendez-Sanchez and Velasquez-Dos Santos that ended UFC 166, a strong candidate for Fight of the Night was the middleweights’ three rounder. I’ll be honest, I was looking forward to Luke Rockhold facing Boetsch, and when the former Strikeforce champ was forced from the bout due to injury, I assumed that a match between former Division I wrestlers Boetsch and Dollaway would result in a style-stifling stalemate. I was wrong, and I’m happy to say that. This was one of those spit flying, blood spilling matches that make you thankful you don’t put on gloves for a living. In the end, I agree with a Boetsch victory, but there was no way Dollaway lost all three rounds, like he did on two scorecards. No way…I loved the fight between Jessica Eye and Sarah Kaufman, and the ladies of the sport continue to deliver. Did I agree with the decision? Well, I think Kaufman’s strong third round edged it for the former Strikeforce champ, but the first two rounds were close enough where judging them for Eye isn’t outside the realm of reality…I’m very intrigued by the Gabriel Gonzaga situation. 5-1 in his last six bouts (all finishes), the former world heavyweight title challenger is described by many as a gatekeeper but after shutting that gate on four Octagon foes (Ednaldo Oliveira, Ben Rothwell, Dave Herman, and Shawn Jordan), I wouldn’t mind seeing him against another top five foe. He came up short against Travis Browne in April, but I think “Napao” has earned another shot…With top-notch boxing and solid takedown defense, KJ Noons can make a lot of noise at 155 pounds, which makes his win over George Sotiropoulos puzzling. Having hurt the former Ultimate Fighter competitor and coach on a couple occasions, particularly in the third round, Noons could have added a knockout to his first UFC win, but he let Sotiropoulos off the hook. He got the win, but with judging always a mystery, not going for the finish when it was in front of him could have been costly…Tony Ferguson’s return was a welcome one, and the TUF 13 winner showed no signs of Octagon rust in his blitz of Mike Rio…Andre Fili and Kyoji Horiguchi were both impressive in their UFC debuts, especially considering the men they beat, Jeremy Larsen and Dustin Pague, respectively, never go away easily.